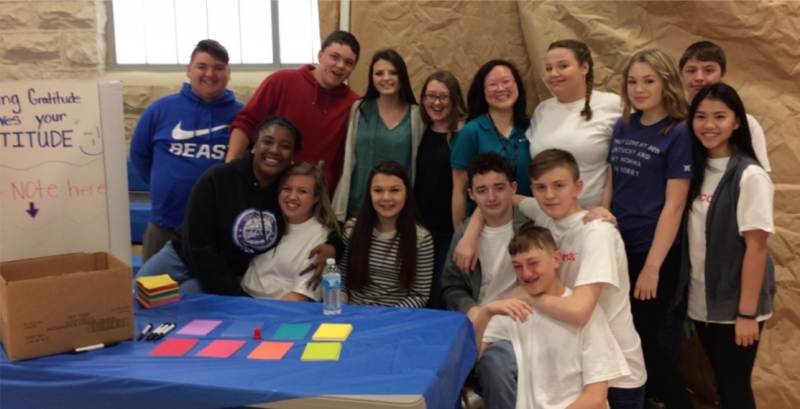 In April 2018, HealthCorps hosted two health fairs with Barbourville Independent Schools – one for the elementary school students (grades 3rd through 5th) and one for the middle and high schoolers. Over 400 students and 30 staff and community members were in attendance at the fairs featuring 15 student-led and 7 community-led booths. Partnering with Mrs. Hannah Valentine and her 8thgrade integrated science classes, students created interactive booths displaying key HealthCorps lessons that are taught weekly throughout the school year. Student-led booths included topics such as: how much sugar is in locally popular drinks, common health challenges Knox County residents experience, gratitude and the mental wellness benefits of expressing appreciation, as well as an exercise course that challenged students to be physically active. Community organizations such as the local Unite coalition, KCEOC and the Knox County Health Department were also present to share relevant information and resources. Beyond advocating for health and wellness throughout the school, the Health Fair provided a unique student leadership opportunity. Students were challenged with the task of taking what they had learned throughout the year and teaching it to their peers, both younger and older, in a fun and interactive way. While an outline, general information and instructions were provided, each group of students took the topic they had chosen and truly made it their own. They dreamed up creative, interactive, and yet informative ways to convey these important messages to a much wider audience than they had ever imagined. How do you try and convey the same information to a third grader as you would a twelfth grader? And how do you make something like drinking water fun and exciting when most kids would prefer something with a bit more taste and a lot more carbonation? These were questions and challenges the students had to strive to answer. While many students were hesitant – and even intimidated – by the task they had been given, each rose to the occasion and at both fairs were able to educate their peers, sharing with them what they had learned in their own unique way. They were able to confidently stand at their booths amongst vendors from the community, whose jobs are in the realm of public health, and deliver their message. In that moment, the students truly mastered the message and became a teacher and advocate of this area of their health. That is why health education and the work being done in schools to improve the health of Knox County is so important; to encourage and enable the next generation to be masters of their own health – to live healthier and happier lives.